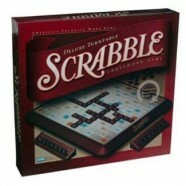 Objective: Played as the regular Scrabble game with added rules. Supplies: Scrabble board and alcohol of choice. For each word that a player forms they give out the point value of the word in drinks (sips, if it's a lot of points). This amount can be split up among the other players. At the end of the game the players who still have letters remaining take the total point values and drink them up.